So you were outside one evening for the full moon, and there was an amazing circle around the moon. Is it something magical? Could it be important, from a magical perspective? A moonbow is just like a rainbow, but appears at night, and is only seen in the part of the sky opposite of where the moon is visible. A lunar halo happens sometimes when moonlight is refracted through ice particles in the earth's atmosphere. If you choose to incorporate one of these phenomena into magic, consider using it in preparation for oncoming negative influences. This ring is not really a magically significant event so much as a scientific one. 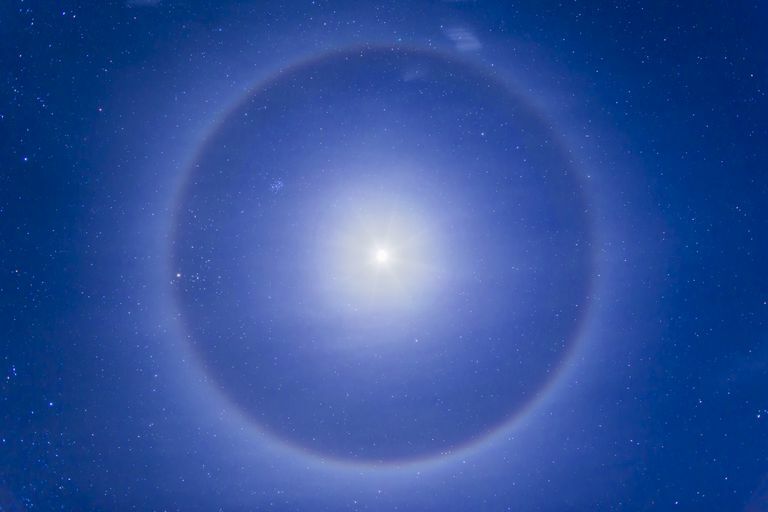 It’s actually a phenomenon known as a lunar halo, and it happens sometimes when moonlight is refracted through ice particles in the earth's atmosphere. It’s definitely beautiful to look at. From a folkloric standpoint, however, many traditions of weather magic indicate that a ring around the moon means bad weather, rain, or other foul atmospheric conditions are on the way. "Halos are a sign of high thin cirrus clouds drifting 20,000 feet or more above our heads. These clouds contain millions of tiny ice crystals. The halos you see are caused by both refraction, or splitting of light, and also by reflection, or glints of light from these ice crystals. The crystals have to be oriented and positioned just so with respect to your eye, in order for the halo to appear. That’s why, like rainbows, halos around the sun–or moon–are personal. Everyone sees their own particular halo, made by their own particular ice crystals, which are different from the ice crystals making the halo of the person standing next to you." Related to the lunar halo is the phenomenon called a moonbow. Interestingly, because of the way light refracts, a moonbow — which is just like a rainbow, but appearing at night - will only be seen in the part of the sky opposite of where the moon is visible. "These are the facts about each of these phenomena: the cause of them all is the same, for they are all reflections. But they are different varieties, and are distinguished by the surface from which and the way in which the reflection to the sun or some other bright object takes place. The rainbow is seen by day, and it was formerly thought that it never appeared by night as a moon rainbow. This opinion was due to the rarity of the occurrence: it was not observed, for though it does happen it does so rarely. The reason is that the colours are not so easy to see in the dark and that many other conditions must coincide, and all that in a single day in the month. For if there is to be one it must be at full moon, and then as the moon is either rising or setting. So we have only met with two instances of a moon rainbow in more than fifty years." Moonbows are not visible everywhere, and they're fairly uncommon occurrences, as we see in Aristotle's work. A few places are known for regular moonbow appearances, though. Where they do occur, they've become a major attraction, particularly in places like Victoria Falls. Their website says that "the lunar rainbow is best seen at times of high water (April to July) when there is sufficient spray to create the moonbow effect. This spectacle is best witnessed in the early hours after moonrise, before the moon rises too high to create a moonbow that is visible to the ground-based observer." According to the folks at Time and Date, there are four requirements for a moonbow to occur. First, the moon has to be sitting fairly low in the sky. In addition, it must be full, or close to it. The surrounding sky has to be very dark for a moonbow to be visible, because even a small bit of light will obscure the view, and there have to be water droplets in the air in the opposite direction of the moon. In general, there is no Wiccan or other Neopagan magical correspondence related to the lunar halo or to the moonbow. However, if you really feel like one of these is something you need to incorporate into ritual, you might want to associate it with a working related to preparing for negative influences that may be coming your way.